The Adelaide Fringe engagement at CIT was supported by Mid Atalntic Arts Foundation through US Artistes International in partnership with the National Endowment for the Arts and the Andrew W. Mellon Foundation. Weights is an extraordinary story extraordinarily told. Poetic, lyrical and potent, yet most movingly of all... true... and told by its protagonist, Lynn Manning who, thankfully, lived to tell the tale. Manning dusted himself down and got on with rebuilding his life, determined to realise his dreams, and overcome the obstacles in his path eventually becoming a successful playwright, a world-class athlete, and a dedicated teacher and volunteer. His is a passionate, inspiring dramatic story for which he has received much critical acclaim winning 3 NAACP Theatre Awards, (including Best Actor). More importantly it is a performance that makes a difference to everyone that sees it. Guy Masterson and Richard and Patricia Burbidge of Shrewsbury's Haystack Theatre were so moved when they saw it in 2007 at Theatre Workshop, that they were determined to bring the work back to a wider Fringe audience at the Assembly Rooms in 2008. IT then played at the Adelaide Festival 2009 to great acclaim. Something I have noticed in recent years at the Fringe is that productions that have any kind of life-affirming qualities or ultimately positive messages, tend to hit a glass ceiling of f'our-stars,' no matter how truly outstanding they are. It is in fashion to be slightly disapproving of life-affrimation as art. Lynn Manning's one-man tour-de-force, "Weights" has achieved several four-star ratings at the Edinburgh Fringe 2008, and I believe it is time at least one reviewer who isn't afraid of applauding both positivity AND outstanding theatre and presenting this production with a well deserved five star rating to a play in which the "universal oneness of all things" is shared and made practically evident. This is a piece of theatre that isn't afraid to chart the darkest hours of a person's biography, yet equally to celebrate, and even offer up to an audience, a happier outcome, and a message that the lowest places we sometimes find ourselves in are the places from which the steps can only rise upward. Lynn Manning, actor, writer, commentator on life, and occasional comedian of the stage, has a rich vibrant voice, which tells a tale so evocative and resonant, it received regular whoops, sighs and spontaneous rounds of applause from audience members. Manning shares his own personal story, creating the voices and gestures, so well observed, of over a dozen characters, in a journey that takes us through his childhood, the sixties, the seventies and toward the now. The violent act that led to his blindness is re-charted and played out with superb pacing, observation, poetry and not a small amount of hindsight-humour. This is fine writing realised on the stage through direct story-acting. We find ourselves in L.A, on Hollywood's famous Vine Street. We stare down the barrel of a gun with Manning, and we stare with him down the tunnel of years that represents his past, present and a future without sight yet brimming with insight. I stopped taking notes after ten minutes, the reviewer's notebook and pen dropped, and I had to just watch and listen. As a performer, his authenticity and directness is refreshing. This is a man on a "free ride to wasted", who takes us beyond the darker years and into a place where he is realising himself through the creative opportunity that blindness has brought him. Manning performs with an economy of movement, a large but graceful soul, his delivery is so on top of his material that it feels as if he is telling the story for the first time. The ability to do that confirms this as outstanding work. Doing my usual, ok where am I next, I frequently arrive at a venue knowing only the name of the production I am about to see and in this case that it is part of the Theatre Tours International & Guy Masterson Productions, the show 'Weights'. Not much of a clue in that, ok sit back and enjoy as you know you are about to witness a superb performance. 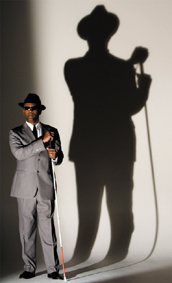 On stage we meet Lynn Manning a six-foot plus vision of a good-looking man with a superb physique, this Afro Caribbean gentleman proceeds to tell the story of his life but there is something about his face. At first I can't put my finger on what it is but as the show progresses I realise, through his performance it is true he is blind. This autobiographical play only reaches from childhood to his mid 20's when he was shot in the face and slightly beyond to show his determination to become a writer. The admiration I have developed for this man is not through sympathy but my respect for what he has been through, the goals he has achieved and this performance itself. He concludes the show by reciting one of his own poems which is absolutely beautiful. This cleverly written and excellently performed piece is an absolute must for fans of the one person show, those of quality theatre and anyone wanting to get excellent value for money. Lynn portrays the characters in his life extremely well. Robert Egan's directorial job would appear to have been a reasonably easy one. This is the second visit to Edinburgh for Lynn Manning's engrossing one-man show, which tells the story of his life from his disrupted Los Angeles childhood through to his being blinded in a bar-room shooting and his subsequent emergence as an independent poet, playwright and actor. Last year, the show was based down at Theatre Workshop, but this year it will hopefully reach an even wider public at the Assembly Rooms. Manning cuts a striking figure from the off. A tall, muscular former world Blind Judo champion, he is dressed incongruously in an outfit that seems to belong more to a Florida beachwalk than the mean streets of LA. His attitude, however, quickly brushes any confusion aside as he begins to lay out in stylish, absorbing detail the events of the day that changed his life for ever, a day (as he says) that was "tipped way too far into the positive not to go tumbling headlong into the negative." His story then winds back from the shooting to talk about his family. His mother had nine children by the time she was twenty-nine years of age. The kids had several different fathers, and the one that Manning talks of most, Bill, was sexually abusing at least two of Manning's younger siblings. It's obviously a sad and harrowing state in which to live, but Manning tells it with not a trace of self-pity; on the contrary, his fluid, quasi-rap style glows with the lustre of his resilient optimism. This trait also brings him into conflict, post-shooting, with a trauma counsellor who simply won't believe that he has accepted his blindness within days rather than taking the three or four months that her textbooks say he should. Lynn Manning was shot and blinded in an L.A. bar at the age of 23. This is his story. The monologue is both written and performed by Manning who delivers a meandering tale of abject poverty, abuse and ultimately prevailing optimism. However do not be misled by this grandiose description  this is a one man play without pretension and a narrative of true drama. The script dives in and out of different stages of Manning's biography detailing the incident in which he lost his sight and subsequent aftermath and reminiscences of his largely bleak experiences of growing up in 1960s L.A. This could have been an opportunity for sentimentalism or self-pity to creep into the script but Manning avoids both and here even the most appalling of stories are narrated with a remarkably rounded perspective. Whether it was blindness that spawned Manning's appreciation of language or if it was a talent given at birth is a question which only really he can answer, but what is undeniable is that this author and performer boasts a fine grasp of poetry. It is not only in his use of poignantly knowable imagery but also in his obvious appreciation of the phonetic resonance of words that one can recognise the potency of this natural lyricist. The script is confident and informed both linguistically and emotionally. Manning the performer is animated; he successfully manages to incorporate the voices of many different characters and the poetic interjections which occasionally interrupt the flow of the narrative. Although the pace was initially a little hasty it didn't take long for Manning to settle into his surroundings and relax into a more measured delivery which was flawlessly engaging. Poet, playwright, actor and former judo champion Lynn Manning knows all about loss. Raised in penury in California, Manning lost his parents to the bottle and his siblings to the foster care system. Then in 1978, aged 23, Manning lost his sight in a shooting incident in a Hollywood bar full of 'tourists, punks, junkies and juicers'. Weights - (11/08/08) - reviewer: EdinburghStraightFringeCut, UK and not upset by a parking ticket! I had no idea about what was on offer. It's better that way! It was only when the story teller Lynn Mann came onto the stage in a very deliberate and exact manner that I realised he was Blind. Lynn is a man of incredible Charisma and character and his stage presence is awesome. The story he tells is that of all of us. The world revolves around you, you can't put a foot wrong, then it all goes pear shaped. For me, after a great weekend it was getting a parking ticket, for Lynn, it was having his optic nerves severed by a bullet. Life is put in perspective and the adversty Lynne has overcome is heroic and all the more poignant because it is a true story told by the man himself. Go see this. It will put a smile on your face and a lump in your throat! Great!